Taken a few hours after the moon was up. The glow in the night sky is just some beautiful light pollution from Las cruces, New Mexico. I spent about a week in El Paso and had the chance to stop by White Sands and unlike the last the trip out there, I did a little research before the 2-hour drive. My first visit was done at sunrise only to be stopped by a locked gate. The light was quickly approaching and opening time was at 7am nowhere near the time of sunrise. Finally a custodial worker arrived and I conjured a million reasons for him to let me in early. He refused mainly for reasons his job could be terminated. I got in my car and drove off looking at the fence with thoughts of hopping over it but with the Border Patrol check point across the street and all adjacent land owned by a military missle range it would have been a really bad idea. A nice soaptree yucca looked pretty appealing at this point just across the street. Most photo locations in California do not close like this so my spur of the moment ideas (I’m very spontaneous) don’t often get spoiled. A lesson learned. While walking along the backpacker trail there are plenty of quick handheld photo opps. White Sands offers up to 10 permits a day and very seldom fills quota as of the date shown here. Alamgordo is a town only 20 minutes away with plenty of hotels if you don’t get a permit. There are really only 9 sites because some owls have taken over one of the sites, so no camping in that one spot (July 2009). Permits are given on a first come first serve basis with no reservations. You must set up your campsite by sunset since it might be a little more difficult to find camp in the dark. There is no trail you just have to find the marked posts here and there. After setting up my camp I walked back to the car and found my I-phone laying in the sand along part of the trail. It must have fallen out during the jog. I headed over to the Alkali Flats trail for photography at sunset. There were quite a bit of clouds in the west from lingering thunderstorms so it looked promising. I regret not scouting out the scene before hand to find some soaptree yuccas in the perfect spot but I was hanging out with the family earlier. So it was not an option. The sky ended lighting up just the way anyone would hope for and I got the chance to see some crepuscular rays. I shot until the light was far from gone and then waited for the moon to come up to head back towards camp. At this point the entry / exit gates are locked and there is no one else in the park but me until the next morning! I photographed moonlit scenes with some high ISO settings until about midnight. Can you imagine how bright the whitest place around could be during the full moon at midnight? On a bad note you think you get away from pesky mosquitos here but not the case. OK here is the best part, sleeping without a sleeping bag, it was the middle of summer of course. The temps vary here dramtically to the season. Morning came and went. It was beautiful and no complaints, all I have to do now is pack up now. The tent and pad attached to my photo backpack so I was gone and on my at about 9am. Would I ever do it again? You bet and I hope a few reader find it inspiring enough to take a trip on out there themselves to experience it on their own. This shot wasn’t planned it was something I just reacted to quickly as the moon was moving fast on the horizon. Had to catch the moon before it caught me. Aiming for more of an artistic feel here I tried to capture the heavenly light at twilight. This entry was posted on November 1, 2009 at 1:01 am and is filed under Uncategorized. You can follow any responses to this entry through the RSS 2.0 feed. You can leave a response, or trackback from your own site. I didn’t get a chance to comment on that last photo when it was up on NPN recently. I love it. I think you said the glow on the horizon was from the rising moon? Anyway, welcome to the weblog world. Sometimes it seems like just one more thing to keep up with, but occasionally it allows you to connect with an audience who wouldn’t have found you otherwise. Have fun. Nice blog always interesting to read of others experiences and photographic journeys. Not that its like I will ever travel up to that part of the world. Welcome to the world of blogging I’m new to that game too. Great to see you blogging! I know this was back in July and the details are a little fuzzy, but I would recommend adding a little detail about how you found the comps you posted. No need to get too technical though. WSNM looks incredible. But every time I look at the map it’s difficult for me to imagine how to work it into a trip. Mat, thanks. The non technical details usually linger around for a long time. Most of out of my out of town work originates from family living nearby. Other than that I stick closer to home. There are a ton of locales to photograph in the area, they are just spread out a little more. I hope you don’t mind me asking, Steve, but what kind of tent is it? I need a new one and yours seems like it makes a great one-man. Plus it looks amazing against the sky in the first shot and the white sand. LOL But the look is not so much a concern… haha! love that last photo! nice work. Great photos and interesting recap. I can understand the temptation of wanting to hop the fence. But sometimes the best spots are found at the last possible minute. Glad to see you had a good time! Otherworldly… is that even a word? Thanks for sharing the story along with the awesome images, and welcome to the blogosphere. Great blog. I am really liking the light on the last image – it is seriously a winner ! Going there withhout any research is ddefinetly something I would do but thhen I would have jumped thhe fence and gotten arrested for sure .. glad I was not there. White Sands must be a fantastci place for creative work. I sent an email to the National Park Service complaining about the nearly impossible conditions they put on photographers. I wish others would do the same. $50 per hour, so if you want to get in a 5:00 a.m., that’s a $100 fee. Outrageous. 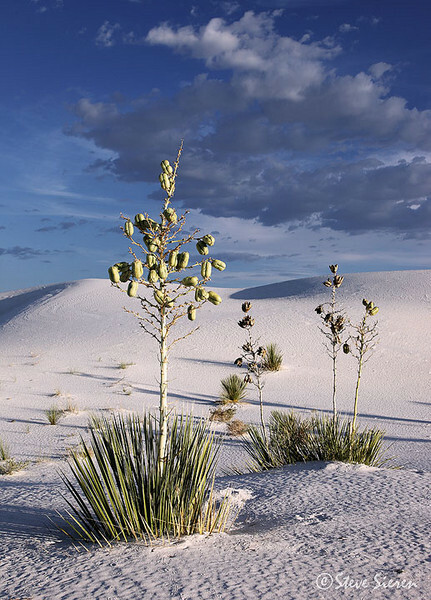 Get on the White Sands NPS website and let them know what you think. Stephen, I don’t mind seeing limits on when you can do things at parks, that is one of the reasons why I wrote this article. Having the place to yourself can be so peaceful. 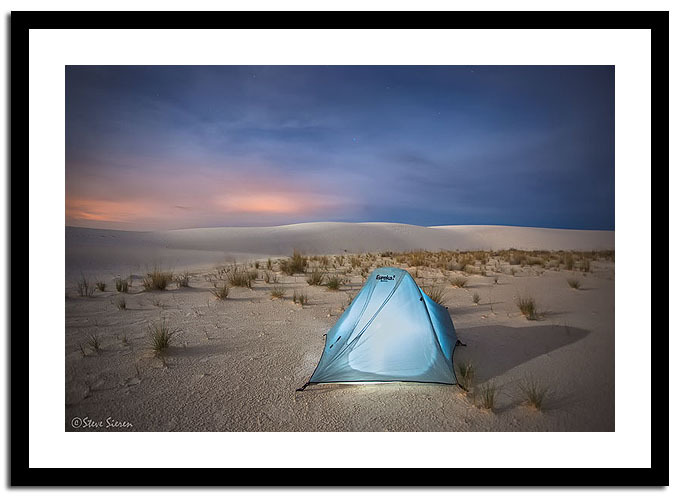 Opening up the park for everyone before 7am might ruin the experience of solitude for the backpackers at white sands since the backcountry sites are only a mile away from the parking lot. 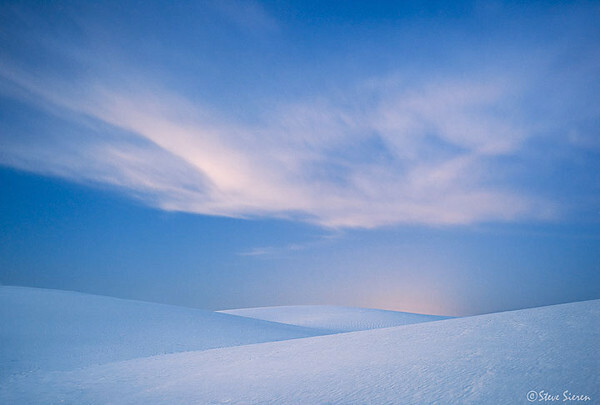 White Sands at sunset can be a very crowded place, the peace and quiet can take a while to find. I highly suggest backpacking there, it’s not hard work and yes you can’t get a late/mocha unless you bring it yourself. You can experience so much more this way.